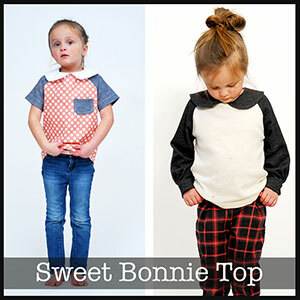 The Sweet Bonnie top is a raglan top with peter pan collar and exposed zipper opening in the back. Long and short sleeve options, and the raglan sleeve is perfect for color blocking and mixing prints. 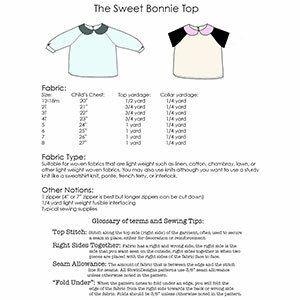 The pattern comes in sizes 12 months through 8 years (for more info on sizing check out the sizing photo). Pattern comes with complete step by step full picture instructions. Suggested fabrics are a sturdy knit such as ponte de roma, french terry or interlock.